India may have been edged out by England in the just-concluded three-match ODI series, but that doesn’t seem to have bogged them down. 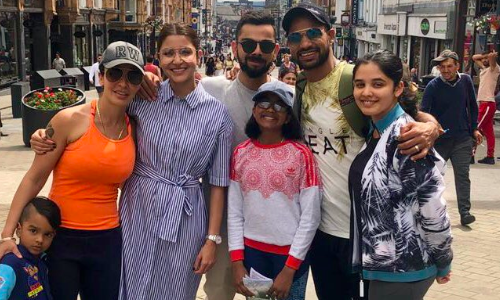 Captain Virat Kohli and opening batsman Shikhar Dhawan were joined by their families as they took some time off to head out and explore England. While Kohli was joined by his lady love, Bollywood actress Anushka Sharma, Dhawan had the company of his wife Ayesha Mukherjee and their son Zoravar. Mukherjee’s two daughters from a previous marriage – Rhea and Aliyah – can also be seen in the picture shared by Dhawan on social media. “Just strolling around the street with these two strangers,” his teasing caption read. Meanwhile, Kohli and company are currently gearing up for the five-match Test series against England, beginning August 1, following a four-day practice match against Essex next week.